Volume two of the East Kent Railway documents the final years, and then offers a comprehensive survey of the railway’s various routes using maps and plans as well as numerous photographs. 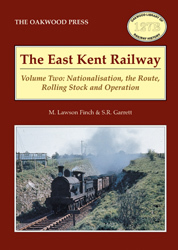 The locomotive and rolling stock on the East Kent Railway was just one of the features that set the EKR apart form other railways and offered rich diversity. It is studied here in great detail. The operation of trains is examined as we look at timetables, signalling, permanent way, tickets, staffing and profits and loss. A5 format, 240 pages, 210 illustration.